Take a turn for the innovative with this collagen beauty treatment spray. It helps optimize your skin's own natural collagen levels and elasticity, as well as promote the look of smoother, younger-looking skin. Add it to your product repertoire for a whole new take skincare. Ingredients: Aqua/Water/Eau, Butylene Glycol, Glycerin, Polysorbate 20, Zingiber Cassumunar Oil, Leuconostoc/Radish Root Ferment Filtrate, Malus Domestica Fruit Cell Culture Extract, Chenopodium Quinoa Seed Extract, Daucus Carota Sativa (Carrot) Root Extract, Panax Ginseng Root Extract, Glycine Max (Soybean) Seed Extract, Oryza Sativa (Rice) Extract, Saccharide Isomerate, Sodium PCA, Panthenol, Lecithin, Caprylyl Glycol, Xanthan Gum, Phenoxyethanol, Amyl Cinnamal, Benzyl Salicylate, Citronellol, Hexyl Cinnamal, Butyphenyl Methylpropional, Limonene, Alpha-Isomethyl Ionone, Fragrance (Parfum). I use twice a day. Its refreshing & brightens skin! Skin feels awake, nourished and my skin glows after spritzing. It does come out strong, but its worth every penny. I will be a customer for life! I use this as a setting spray before I go to bed. I have been using it a couple of weeks and can tell that my skin is plumper, smoother and softer. 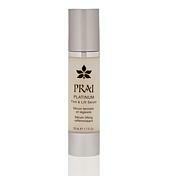 Prai is my new go to skin care because it works and is affordable. I love that I can trust these products to deliver! Thank you! I am a fan of Prai and have been for years.This collagen spay is fantastic ! One wish please can you refine your spray device, The mist needs to be finer. Presently there is no control on the applicator and it comes out too heavy. I find myself using a tissue to dab the excess.Thank you again and again Cathy for everything!!!!!! You will never smell anything better.. I used this after I received it and it smells heavenly. It is so refreshing to the skin and the smell lasts for quite awhile. I will buy again and I would recommend.